In 1939 the first seasonal dam was installed by the Council in order to back up East Austin creek to form a small lake for swimming. The dam was a basic gravel dam put in place each year that contained an area where boards could be used to raise and lower the level of the water. Until the creek was dammed, swimming at Royaneh took place at the ye ole swimming hole at a location affectionately known as Romans Plunge. This was an area on the creek where a natural deep swimming hole was located and is still occasionally used today. The damming of the creek to create a swimming area and later a canoe base would take place for almost 50 years. In 1989 the canoe base operations were shut down permanently when the Department of Fish and Game determined that a small shrimp that lived in East Austin Creek was endangered. The official reason for the action is that “sediments dislodged from their construction and removal "may endanger" the shrimp's habitat. However no study was done on the impact of siltation by heavy winter rainfall runoff and flooding, as the DF&G exhausted their funding allocation. Regardless, seasonal gravel dams created by all the property owners could no longer be constructed on any portion of the creek after 1991. This action stopped all activities that took place at the canoe base including canoeing and rowing and which had been added to the camp program in 1953. The horse program also began in 1939 with the opening of the Bar H ranch which was adjacent to the camp where the archery range is currently located. Scouts that enrolled in the horse program slept with their troops and ate in the dinning hall, but all daily activities took place up at the ranch. The bunkhouse located below the archery ranch was the ranchhouse of the Bar H ranch. In 1961 the horse program moved from the location of the Archery range to its current location when Bob Clarke dedicated the new barn and corral. In 1950, 25 acres of land adjacent to Royaneh was purchased from the Scanlon family to allow for a year round road to be built into camp from the Cazadero Highway. As a result of this acquisition both Scanlon road and the Scanlon Ridge Campsite are named after the local family. Prior to 1950 the access road to camp was across a seasonal one-lane wooden bridge that spanned East Austin Creek. The small one lane road crossed the creek and came into camp near where the current main road splits between the camp and the canoe base. The road traveled next to the creek until it turned uphill near the old canoe base. During the rainy season cars would have to park on the South side of the creek and visitors would walk across a suspension bridge to access camp. In 1950 the council also began discussing a location of where to build a swimming pool as the existing swimming hole that was created by damming Austin creek was getting less and less “pure” due to summer cottages being built near the camp. The site selected for the soon to be built pool was on a hillside above the Scout craft area which contain an orchard. In 1951 with funds provided by Walter Haas, construction began on the Lucie Stern memorial pool and poolhouse. Water for the pool, in addition to the camp, was pumped from a 60 foot well on East Austin Creek up to a redwood tank. Occasionally the pool is so cold, even during the summer months, that ice bergs have been known to drift around as if you were swimming in the arctic. Construction on the new admin building and health lodge for the camp began in 1952. The former Tevis Hospital which was located next to the amphitheater and spanned the small creek was cut into two sections. One section was moved across the creek into the flat area to be used for the new scoutcraft building now known as the Chalet. The other half of the Tevis hospital was dragged down the road and was used as a portion of the new health lodge. When the Admin building was completed it was dedicated in 1953 to the first Scout Exec of the San Francisco Council, Raymond O. Hanson who died in 1944. Five years later in 1958 the Trading post and Chiefs room would be added to the Admin building complex by funds raised by Royaneh Lodge of the Order of the Arrow. The original dinning hall that was built by Louis Kern in 1925 was replaced in 1983 with a slightly larger dinning hall after the original building sustained major damage during the winter of 1982. During this timeframe, all camp dining was held down in the Quonset hut next to the corral and the food was transported from the kitchen down to the Quonset hut. Over the next twenty years new activities would be added to Royaneh including Mountain Man and the COPE Course, as well as major reconstruction of the Septic system, upgrades to the Pool and Pool house, a new main shower house and rangers cabin. What will the next 85 years of Royaneh History Bring? For additional information on the Camp Royaneh history, refer to the “History of Camp Royaneh” document compiled by Indie Nelson. In 1914 the Sonoma Magnesite Company built a 24” gauge railway from the narrow gauge junction at the Watson station (where the Old Cazadero Highway and Austin Creek meet) 12 miles up East Austin Creek to their processing plant and then another 3 miles to their mine. Magnesite is a mineral used to produce slag in the steel making furnaces. The line operated from 1914 until 1918 and used a small 0-4-0 steam engine to pull its flat cars. This line was discontinued shortly after World War I due to the high cost of transporting the ore. Although the Sonoma Magnesite line was never active once the Scouts took possession of Camp Royaneh, the tracks through the Scout property and along East Austin creek remained in place until 1937 when they were removed. 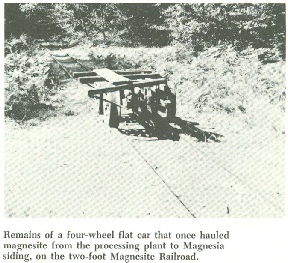 A section of the 24” gauge Magnesite right-of-way can still be found at Royaneh where the “Narrow Gauge” Cairn is located. Rumor has it that the remains of the 0-4-0 locomotive are still located somewhere up East Austin creek. In the 1970’s some train buffs using a metal detector were able to dig up a few hundred rail connectors that were used on this small rail line, which were used in the construction of the Tilden Park minature railway in Berkeley. Camp Royaneh - The First 75 years 1925 - 2000” written by Joe Ehrman and edited by Charlie Erle. Members of the Staff at Camp Royaneh including John Sundet who passed away in the spring of 2009. Updated by Indie Nelson in 2010.